This is a residential (Class 2 | Cat 1) water loss. The drywall and insulation were removed 2′ up the wall along the entire perimeter. These activities were spearheaded by a mitigation crew that executed the mitigation phase in a fairly sloppy way, e.g., the insulation was pulled out of the wall cavities well beyond the flood cut, the drywall was not snapped off, and the cuts were jagged. 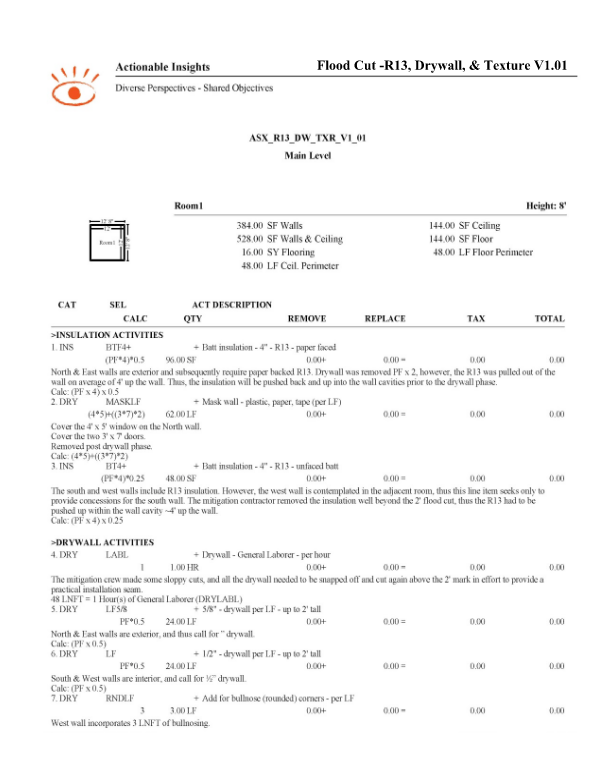 This Insight Sheet© exists to clarify how one might invoice for insulation, drywall, and texture when repairing flood cuts. This does not seek to include or make concessions for all equipment and/or activities as it relates to a loss of this nature. Why is the calculation on the insulation *0.5? In this particular loss, as mentioned in the F9 note section, the North & East walls are exterior and therefore had paper-faced batt insulation. 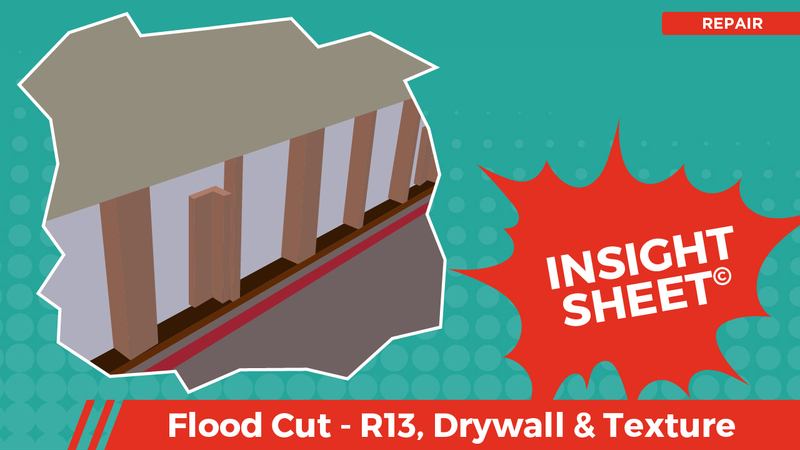 The room in this situation is a perfect 12'x12', therefore a 0.5 calculation can be employed as only half of the walls use paper-faced insulation, while the other half is unfaced and addressed on Slide 7 (INS BT4+). Traditionally, paper-faced batt insulation is used on exterior walls due to the additional moisture/vapor barrier, whereas unfaced batt insulation is used on interior walls.